Vincent Lacerenza and Manuele Tigani are the co-founders of the Dolls Combers. They are both 34 years old, they live in Milan but their roots are in the South of Italy. 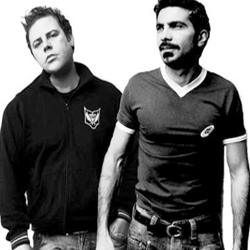 The first time they met it was in 2004, they share the love for house music (with influence of jazz, soul and funky), wich is on the basis of their successful friendship. Manuele started to use pc-programs to compose music and Vincent with his major experience gave him a good support with suggestions and tricks. Step by step they shared their ideas about music and sounds in such a useful way that new worthy music sounds out giving birth to the challenging project of the Dolls Combers. Vincent began as a dj in the far 1985, he span the records in many disco pubs around Milan till 2000. In the 1994, he started up his own record studio and so he began to move his first steps in the world of music productions. He was interested to the house music movement all over the world, and particularly in Italy. In his own productions he tried to use a 360° point-view with the help of others djs and musicians. He made music with different nick-names: X-tribe, W&J, Vincent L. and Optical Funk. He improved his music taste during this years. Manuele bought his first vinyl around the 1985, he started to learn the art of mixing, and after few years he began to spinning the records for friends during students party, and then for some disco-pubs in Milan. After 20 years he is still buying records, and since then , when he buys a new vinyl and he starts to listen to it the same old magic sensations reach his soul and his mind. In his stock he has got about 5000 records and the most of them are deep and jazzy with some pearls from labels that have made the history of house music. At the beginning of 2004 he began to assemble his own home studio record. Little Angel Records is a division of Clubstar Gmbh/H&M Productions S.a.S.